Does Philadelphia need a law mandating affordable housing? 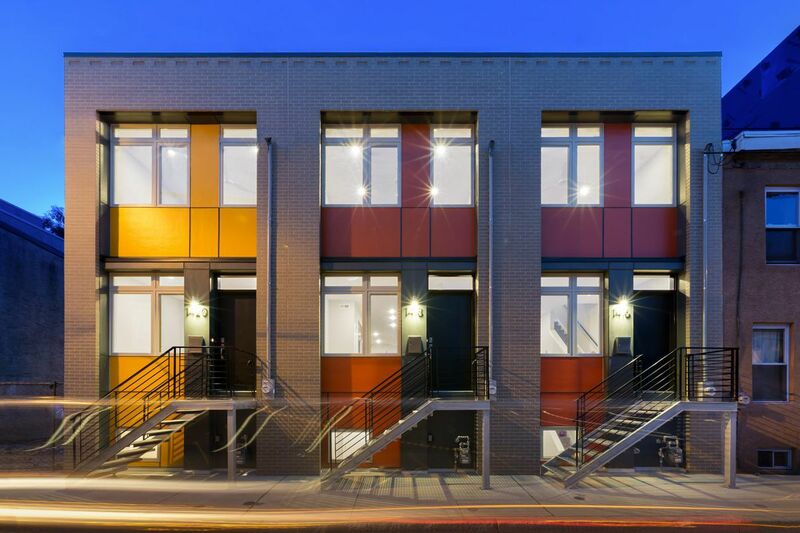 Innova Services, a for-profit developer specializing in affordable housing, built 19 homes in Point Breeze for various income levels, ranging in price from $225,000 to $350,000. San Francisco does it. New York does it. So does Washington. As their housing costs have skyrocketed, pricing out the working poor and making it difficult for even middle-income people to find affordable housing, those cities have adopted laws requiring new developments to include subsidized units for low-wage workers. Now, a City Council member wants Philadelphia to join the club. The difference, of course, is that Philadelphia already has some of the cheapest housing stock of any big American city. A typical two-bedroom apartment in Philadelphia rents for $1,160 a month — a third of what the same unit would go for in San Francisco. The median house price here is a modest $137,000. Even in some of the city's most desirable neighborhoods, it's still possible to find a house for $300,000. Our recent pitch to Amazon made Philadelphia's affordability one of the city's selling points. If Philadelphia is such a bargain, why would the city need to mandate inclusionary housing? The Bridge in Old City is the only project in Philadelphia to comply with the city’s voluntary inclusionary housing program. Fifteen units are set aside for low- and moderate-income tenants. That's the question developers and economists have been wrestling with as an inclusionary housing bill hurtles through City Council. Headed by Councilwoman Maria Quiñones-Sánchez, the bill would require developers to offer 10 percent of their units at substantially reduced prices to renters and buyers earning salaries below $41,000, Philadelphia's median household income. As compensation, they would be allowed to build higher and denser than the zoning code normally allows. The first hearing is scheduled for Nov. 27, and Sanchez is determined to get a vote on the bill by the end of the year. Sanchez says she sees inclusionary housing as a way to get developers, who have benefited enormously from the 10-year property tax abatement, to give back. Since the tax break was introduced in 2000, house prices have doubled or even quadrupled in some areas, and formerly depressed neighborhoods, like Point Breeze and South Kensington, have exploded with new construction. As gentrification has swept through old rowhouse neighborhoods, the residents, especially renters and elderly people on fixed incomes, find it more expensive to stay. But just because Philadelphia is a bargain in comparison with its peer cities, Sanchez argues, doesn't mean housing is cheap for people who live here. If you're a single mother working a full-time retail job, finding a decent rental in a transit-accessible neighborhood has become nearly impossible. It's not easy for college-educated millennials, either, especially if they are carrying student loans or paying for their health insurance. "These are working people who need quality housing," Sanchez says. Though it won't solve everyone's housing problem, inclusionary housing "is another tool in the took kit." That's all true, but it doesn't necessarily follow that Sanchez's bill is the right solution, particularly in its current form. No one was surprised when the Building Industry Association, which represents the city's housing developers, came out against mandatory inclusionary housing. They'll be the ones taking the biggest risk, because they have to fund the subsidized units up front and hope that the extra density will offset their costs. "Margins are already tight," complains Leo Addimando, vice president of the association. But since the bill was introduced in June, developers specializing in affordable housing, such as Jeffrey Allegretti of Innova Services, also have voiced concerns. The automatic extra height or density isn't going over well with neighborhood groups, either. Although the zoning code is far from perfect now, at least it guides taller buildings to wider streets that handle density. The biggest concern is that the bill will backfire and actually reduce the amount of affordable housing being produced in Philadelphia. That would happen if the cost of providing subsidized units becomes so high that it discourages developers from building at all. Pricey markets like San Francisco have more of a cushion to help developers absorb the costs. But because house prices are relatively low in Philadelphia, even a modest cost increase can cut into profits. Banks will refuse to lend money to iffy developments. "The last thing you want to do is discourage development," says Jenny Schuetz, an urban economist at the Brookings Institute, a Washington think tank. For all the risks, inclusionary housing programs haven't proved all that effective. San Francisco, which adopted the requirement in 2002, is producing an average of 140 affordable units a year, a drop in the bucket considering that city's housing crisis. Boston has done slightly better, turning out roughly 260 units a year since 2000. Beth McConnell, a housing advocate who serves as policy director for the Philadelphia Association of Community Development Corps., estimates that under the proposed law, Philadelphia could produce about 200 units a year. The Paseo Verde apartments at Ninth and Berks is a model for developing affordable housing. The developers acquired the land for a dollar from the city and tapped into a variety of federal housing credits to produce a mixed-use, mixed-income project that includes 129 units of housing for low-income residents. Critics say that number is overly optimistic. To Innova's Allegretti, there are better ways to produce for-sale affordable housing. By tapping into the city's existing programs, he was able to build 15 affordable units in Point Breeze that will sold for an average of $239,000. That price might seem high, but the housing is targeted to people earning between 80 percent and 120 percent of median income, about $53,000 to $80,000 for a couple. People earning less, in Allegretti's view, will have a more difficult time financing new homes and will be less able to afford their upkeep. He also believes that "Philadelphia doesn't really have an affordable housing problem. It has a housing quality problem," and he supports programs that focus on fixing existing housing stock. Many housing advocates agree. Unlike San Francisco or New York, Philadelphia is a city of homeowners, but a leaky or collapsed roof can make their house uninhabitable. One way to increase the supply of affordable housing is for the Philadelphia Housing Authority to develop units using public money. These houses are part of the Sharswood redevelopment in North Philadelphia. Rather than mandate new affordable units when Philadelphia already has plenty of affordable housing, the city could beef up its Housing Trust Fund, which supports programs that help low-income homeowners make repairs. Sanchez's bill would allow developers to make payments to the trust fund instead of incorporating affordable units into their projects. But it complicates the effort with lots of other requirements. Mitigating the impact of Philadelphia's changing housing market is a worthy cause, but there is a simpler and less expensive way to help low-wage workers: developer impact fees. Instead of imposing extra risk on developers and tampering with the zoning code, the city could collect a fixed fee from developers based on the size of their projects. The money would go into the Housing Trust Fund to greatly expand the home-repair program. Philadelphia already has thousands of affordable homes — more than developers could ever create through an inclusionary housing program.